Product Information- A powerful blend of pure honey and apricot extracts along with natural oils that help to nourish the skin and tighten the pores. This moisture mask lifts impurities very effectively and also controls facial hair and lightens stretch marks. Directions for Use: Clean face and pat dry. Apply a fine layer on the face and neck. Avoid contact with eyes. The mask should not drip. When it dries peel off gently. Preferably follow with Jovees Fairness Lotion. This peel off facial mask comes in a beautiful apricot colored tube. The packaging is quite attractive and it claims to nourish the skin and tighten the pores. It has a flip-open cap which is tight and okay for traveling. The tube is not that big and can just slip into your purse easily. 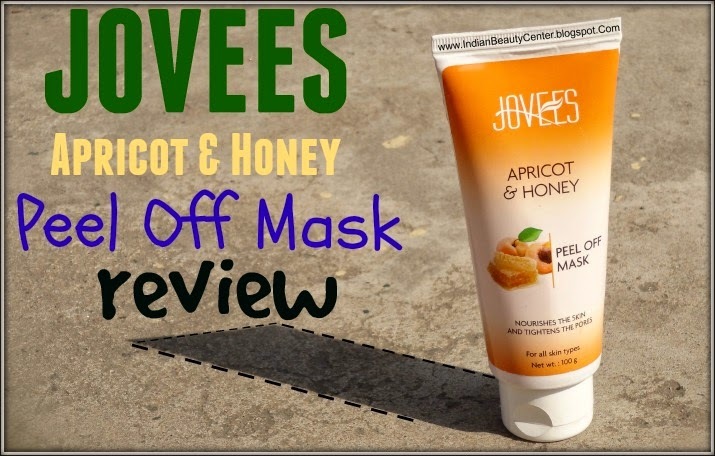 It asks you to preferably follow with Jovees Fairness Lotion after using the mask. One thing that bothered me was that it does not mention the full list of ingredients and so I don't know if it contains any comedogenic ingredients. The mask is very thick in consistency and is slightly difficult and messy to apply. After application, washing your hands becomes even a greater problem because this mask just does not get off of my hands in the liquid state. So, I have to remove it using a washcloth. You can also wear disposable gloves and then apply this peel off mask to your skin. The fragrance is a like a mixture of alcohol and oranges- at least that is what I feel, personally. 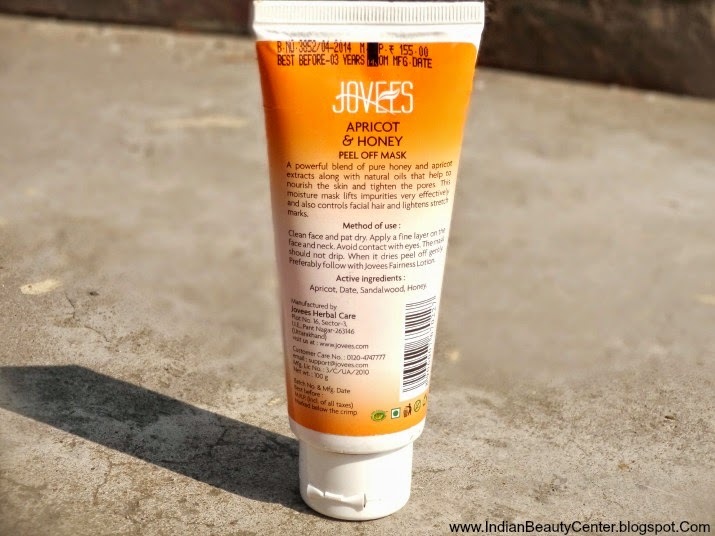 Once I apply the Jovees Apricot and Honey peel off mask, I feel that my skin feels cool and all the heat starts to evaporating. I feel that this mask gives my skin a alcohol-like cooling feeling. The masks takes 20 minutes to dry completely and then I peel it off. The mask is not that difficult to peel off and peeling this off is easier than most other masks. I have noticed that on some places on my face this mask is a bit harder to pull and easier to peel on the rest of my face. Anyways, after peeling this off and using a nice face wash like Cetaphil Cleansing Lotion or Ponds Pimple Face Wash, I see that my skin looks fresher, softer and smoother. Also, it removes dead skin cells efficiently and I love the fact that it can be used once a week to keep the skin fresh and glowing! Final Verdict- This is a really nice peel off mask that really helped to get rid of impurities from the skin. It does take some time to dry, more than other peel off facial masks and this is a bit messy, however this offers better results. It has actually reduced the tendency of my skin to break out easily. However, this might not be the best peel off mask if you are looking for miraculous results. I will keep on repurchasing this until and unless I find something better than this. I do recommend all of you to try out this mask and people with all skin types will love it, I hope! Have never tried a peel off mask. But this one sounds interesting. This one sounds very impressive! Thanks for the review Arpita!